I am known to wear my hair up in a ponytail. Its just easier. There is no hair in my way. I am going to try to attempt putting it down since in a couple of months I am going to be cut it off. Try to read at least ten books. I have a checklist of what I need to read this month. So hopefully that will be a success. I am going to start taking pictures. I got a Canon Powershot for Christmas. So I have a greater reason to take pictures. Hopefully I will make blog post series about my photography journey each month. Start Reading the Bible more. I am gulity of not reading the Bible daily. So I going to start reading the first book of the bible, Genesis. While I read, I am going to start bible journaling as well. I am currently rewriting my story, A Prisoner of Scales. Hopefully by the end of the month, get a quarter of it done. What are you guys’ plans for this month? 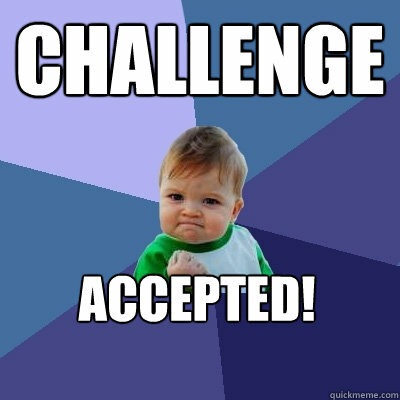 Are challenging yourself? Tell me in the comments below. The beginning of many months. Let’s do this.